Are you applying for 2020 entry? If so, you’ll have to sit the UCAT instead of the UKCAT. You can find out more about the change here. This year Bristol has completely revamped how it selects students for interview. In the past, Bristol was known for being very focused on personal statement. For 2019 entry, Bristol will no longer be using personal statement to select for interview and instead focus solely on the overall UKCAT score. It appears applicants will be ranked on their overall score. Bristol have commented that if they used this approach for applicants for 2018 entry, those with a score of 2660 or above would have gained an interview. This would have equated to a score in around the top 30%. However, the score needed this year could easily change. Previously Bristol attracted students with low UKCAT scores because it only placed a small emphasis on the test. Now that Bristol is placing larger emphasis, applicants with higher scores may be more likely to apply. Bristol comment that personal statements may be used to differentiate between applicants with identical interview scores, but UKCAT scores will still be the primary differentiator. The SJT is not used. UKCAT makes of 40% of selection for interview at Birmingham, and GCSEs the remaining 60%. 7 GCSEs are scored. These must include English Language, English Literature, Maths, Biology and Chemistry, plus 2 other subjects, with up to 6 points awarded. For the UKCAT, the overall scores of applicants are separated into deciles and awarded up to 4 points. Be aware these are not the same as the overall deciles published on the UKCAT website. Instead these are the deciles of those applying to Birmingham. They comment these are likely to be different to last year’s deciles, but only marginally (your score is unlikely to move more than one decile). Last year’s deciles can be found here. Your UKCAT and GCSEs collectively give you up to 10 points. Applicants are then ranked on this and a threshold is set, with those above the threshold receiving an interview. Up to 20% of interviews are for ‘contextual applicants’. These are applicants from particular schools – around 90% of state schools are included. The threshold for contextual applicants is lower. For 2018 entry, the threshold for interview was 8.09, and 6.67 for contextual applicants. For 2017 entry, this was 8.12 and 7.08 for contextual applicants. You can calculate an estimate of how many points you will receive on Birmingham’s website. The Personal Statement is not usually used to select for interview. The SJT is used at the interview stage. Keep in mind that if you score Band 4 in the SJT, you would need to do especially well at interview. More info on this can be found here. At Dundee, applicants are ranked on a combination of academics and overall UKCAT score. Academics contributes 60% and is scored using both GCSEs and achieved/predicted A-Levels. Your UKCAT is then sorted into one of 10 different groups and given points based on this, contributing the other 40% of the ranking. This means that a low UKCAT score can potentially be made up for with some good academics and vice versa. In the words of Dundee themselves: “There is no specific cut-off applied but obviously a high score is advantageous.” So how high are we talking? Well, Dundee state that for the 2016 applicant cohort the average UKCAT score of applicants invited for interview was 2740. Once you are invited to interview, offers are made based purely on interview ranking and information on the UCAS form. The SJT is not used, but “Band 4 may affect the decision on whether or not to make an offer”. At Aberdeen, applicants are sorted into deciles depending on their overall UKCAT scores. They are then allocated points, which contribute 20% towards the application process. 30% then comes from academic attainment or predictions. GCSEs are not scored. These two elements are used to select for interview (which will contribute the remaining 50%). The SJT may be used when making offers to applicants with similar scores. Although the personal statement is reviewed, it doesn’t contribute to the scoring, but will be assessed during the interview. Amazing academics can compensate for a low UKCAT, and vice versa. 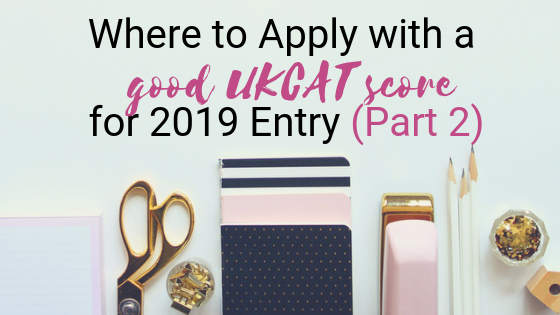 In fact, for 2018 entry the lowest UKCAT score for an applicant given an interview was 2380. Be aware that for Scottish universities, there are separate places for Scottish students and for students from the rest of the UK. If applying the rest of the UK, there is more competition. For such students, the lowest UKCAT score invited to interview for 2018 entry was 2440. Remember the interview makes up 50% of the overall application. This makes Aberdeen quite unique by using UKCAT alongside interview. Most medical schools will forget about your score once you get to the interview stage, but not. If you secure an interview with a low UKCAT score, you will have to do especially well at the interview to make up for this.